The blue whale may be changing its tune. 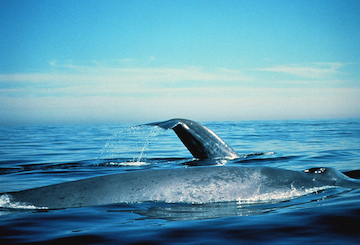 Recordings made over the last couple of decades show that the whales are “talking” at a lower pitch. And it’s possible that the changes are intentional. The world’s largest animal produces a variety of sounds. Some are short -- like individual words or syllables. Others are longer -- “songs” that can be heard for miles. Biologists aren’t sure just what the sounds mean. They could play a role in mating, foraging, or even in keeping a comfortable distance between individuals. A recent study of blue whales off the coast of California found some interesting patterns. For one thing, males were more vocal than females, and they did a good bit of their talking at night. The whales produced songs mainly around dusk. And one type of sound that scientists had thought was related to feeding may not be. Instead, it may help the whales find their mates after they return from deep dives. Another study found that the whales make their sounds by blowing air over their vocal cords. That process allows them to control the pitch. Some researchers speculate that the whales are using that ability to compensate for changes in their environment. The seas have gotten louder in recent decades as global shipping has increased. And thanks to reduced hunting, the number of whales has increased, too. So blue whales may be changing their tune. They may vocalize at a lower pitch -- making it easier to stay in touch in the noisy oceans.